Join us for a 4-day backcountry adventure in Moab’s canyon country! We’ll ride from the Needles District of Canyonlands National Park to Moab. With its primitive spirit and Wild West atmosphere, our ride past towering hoodoos and otherworldly rock formations through Lockhart Basin offers the perfect getaway. Durango Colorado has one of the best mountain bike trail systems anywhere! Our intermediate tour will showcase awesome singletrack found at lower elevations than our Colorado Trail Tour, yet we’ll still ride some of the best trails this remarkable area offers, including Hermosa Creek Trail, parts of the Colorado Trail and a mostly all day descent to Junction Creek. We return each evening to a comfortable base camp located at Junction Creek. This is a journey through the lands of the mythical “Kokopelli” or wandering flute player exemplified in Southwest rock art. Our route ranges from singletrack to slickrock, aspens to pinyon pines and offers sights that will wow your senses and terrain that will definitely test your riding skills. The Kokopelli Trail begins with challenging singletrack, leading to fun, rugged 4 wheel drive trails that touch periodically on the Colorado River. From the Top of the World we descend into Fisher Valley and Onion Creek Canyon, one of the most beautiful and colorful spots in Moab’s Canyon Country. The final day offers a choice of riding Moab’s legendary Porcupine Rim or Slickrock Trails. We have pioneered backcountry biking tours with your safety and enjoyment our highest priority. Rim Tours does it right! My son and I booked this bucket list trip as a way to celebrate milestones. Rim's guides picked up all the bikers for our tour. Every part was easy!! Our guides, Beth & Dave, we could not praise them enough! So knowledgeable, polite, laid back yet true leaders. Oh, by the way, Awesome cooks. Our meals, OMG good!! Incredible riding and terrain for all levels. Guides are not only great riders but wonderful cooks! I am a picky eater however I was able to eat and truly enjoy every meal. 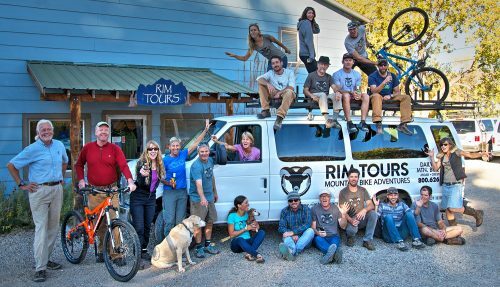 If you are into mountain biking this is your tour company. We booked the half-day Dead Horse Point tour. It was perfect! The scenery is amazing, and the trail is very fun to ride. Our guide Cullen was excellent and very professional. Rim tours organized this tour very well, and the bikes were high-quality. We enjoyed this trip very much. Best tour/vacation I've ever done. Rented top of the line bikes. Fantastic food (I mean really good) cooked for you, truck transports your tent/sleeping bag/gear. amazing scenery. Guides were a wealth of knowledge about biking, geography, geology, environmental science, area history, fun facts, gourmet cooking, -- just all around superb. I was super impressed and happy with the Kokopelli trip Erik and I did with Rim Tours. These guys are great! If you are looking for a mountain bike adventure, you don't need to look any further. Rim Tours is the best!! ...the guides ...were truly amazing. They did a great job to organizing the group so that everybody could ride how they wanted... after riding all day, they also set up comfortable camps (hot towels and showers), and cooked just incredible food... It was a trip of a lifetime and Rim Tours made it great. We loved our Moab mountain bike vacation!!! Sam and Noel were awesome giudes - they were knowledgeable, fun and treated us like family. Their attention to detail was perfect! We can’t wait to go back!